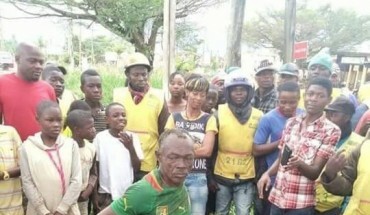 According to the Facebook user who shared the photos, this incident allegedly happened in Cameroon. Some people need some education, to be honest. So here’s what they are alleging. That the man went to sleep the night before after he turned himself into a cockroach or a small animal and hid himself in a truck rim…but forgot to wake at dawn. That he turned to his human form after forgetting where he hid himself the night before and got stuck in this rim. Now, he’s being labeled a wizard. Biko people, how do you figure this man got stuck in that rim? I think he’s just a man with mental issues, probably homeless, who was playing around with the rim and got stuck in it.